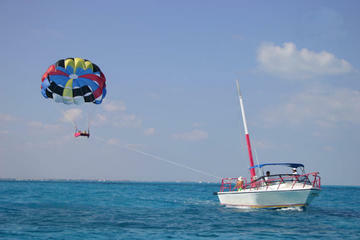 Cancun Parasailing: A Vacation View To Remember! BEST PARASAILING IN CANCUN MEXICO!! Click to watch, hover for the title or scroll to reveal the next set of video thumbnails. There are 40+ Parasailing Cancun (Riviera Maya) videos above that show you this extremely fun water attraction! Here is a great deal from Viator a top name in tours and excursions! Did you ever want to go parasailing but were afraid to do it alone? Imagine the feeling of soaring high above the Cancun hotel zone and exploring all the sites from a bird’s-eye perspective! On the Cancun Parasailing Adventure you can do just that – and not alone but with a friend! Comfortably seating up to two passengers, this experience allows you to sit back and take in all the sights from the Cancun skyline.